People have been convinced that passive voice is never to be tolerated (See what I did there?). That’s an insupportable idea. If you have been led to believe that using the passive voice is always wrong, please read on. I’m sure what happened is what always happens with grammar myths: a good general principle grows over time into an iron-clad rule. Here’s the reasonable principle: active voice is usually preferable to passive voice. Certainly, an over-dependence on passive constructions is a common problem, particularly in academic, business, and government writing. It’s a bad habit among those trying to sound formal or academic. It’s also a way of communicating about sensitive things without taking or placing blame. That’s why passive voice is so popular among politicians! But there is are several situations where passive voice is the better option. It wouldn’t exist if there was a reasonable use for it, right? I’ll give you some examples below, but first, let’s review active and passive voice. Let’s clear up a misconception. Passive voice isn’t simply using “to be” verbs. The verb “to be” in all its forms — am, is, are, was, were, be, being, been — is a useful and unavoidable part of the language. It’s a bland verb, to be sure, and good writers always look for ways to replace it with stronger action verbs, but it’s not the same as passive voice. The sentence I am often brilliant includes a be-verb and is in the active voice. Neither is passive voice simply the use of helping verbs to create verb phrases. 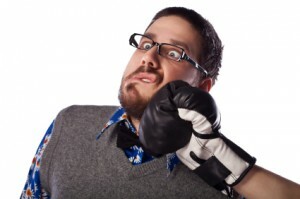 Passive voice requires verb phrases, but not all verb phrases are passive. The sentence My teeth are chattering from the cold includes a verb phrase, but is in the active voice. Daffy Duck ran for Governor of the Idaho. Daffy Duck was elected Governor of Idaho. Daffy Duck is the subject of both sentences. In the first example, Daffy Duck ran. The subject in this sentence acts. He does the running. This is the active voice. In the second example, Daffy Duck doesn’t act at all. He is acted upon. He was elected. This is passive voice. If you think you understand the difference, try the quiz below! A reindeer ran over Grandma. The first version is more common because it focuses on poor Grandma’s victimization at the hands of a careless caribou. The second, active version seems an odd way of putting it. Barack Obama was twice elected President of the United States. Voters twice elected Barack Obama President of the United States. Both versions of this sentence are grammatically correct. The first is passive and the second is active, but neither is necessarily better than the other. The first emphasizes Barack Obama and would be appropriate in a report, biography, or article about the President. The second works better in a situation where the emphasis in on the electorate rather than the candidate. Active verbs tend to do a better job of moving sentences along and creating a sense of action and purpose. They are more lively and dynamic. That’s why you should stick to active voice unless a situation clearly calls for a passive verb. Dad’s new car was driven carelessly and the fender was scratched. Tim drove Dad’s new car carelessly and scratched the fender. It’s probably clear to you that the second option — the active one — reads better. It’s tighter and the verbs are stronger. If you were Tim, however, you’d probably prefer the first version, since it leaves you out of the picture. And that’s the point. Unless it will get you in trouble, good writing typically shows actors acting. Make your subjects do stuff and your writing will improve. But don’t turn this principle into a law. There is a time and place for passive voice. *This sentence has two passive constructions. 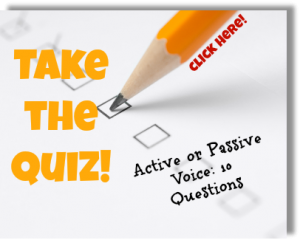 Can you distinguish active voice from passive voice? Take this quick, free quiz! Comments are loved by us. Or should I say, we love comments. Either way, leave yours below! Part of the problem is that the myth is so widespread that computer grammar checkers sometimes highlight all passive voice usages as incorrect. Microsoft Word and fanfiction.net do this. It is an overzealousness which is damaging, because passive voice is sometimes better. The programmers should have realized that the AI isn’t sophisticated enough to detect when the passive voice is correct and when it’s not. I like passive voice and often use it. When you’re describing characters in fiction you can’t always treat them as the actor. Yes. And this is one reason why I always turn off grammar checkers and recommend that others do also. It’s also why my business: WriteAtHome, which employs live writing coaches, will never be replaced by computer programs. Not, at least, until computer programs can make subjective judgments and develop an aesthetic sense. I learned, after working with a WriteAtHome PPP student on a scientific abstract, this week, that many of the sentences are supposed to be written in passive voice. News to me! Good clarification, thanks! The information in this post was received well by me. When my WriteAtHome students struggle with an overdependence on passive voice, I encourage them to consider what part of the sentence best drives the descriptive power. Oftentimes an active verb does that, but not always. Sometimes you want to draw attention to another part of speech, so in those cases a passive verb helps clear the way for that other part of speech to stand out. That’s a good way of thinking about it, Paul. Thanks for that! Especially the beginning bit about how good guidelines become bad laws. I find more and more as I get older that truth almost never lives at the extremes. You’re welcome, Dane. I am learning the same lesson about avoiding extremes. And the principle is far more important in subjects other than grammar! Thanks for the comment. I have a habit of writing passively. Thank you for this information, it really helps!